Tearing is one of the most common symptoms of dry eye. Dry eye syndrome, or keratoconjunctivits sicca, is extremely common and affects upwards of 300 million people worldwide. It is also the most common reason for a visit to your eye doctor. 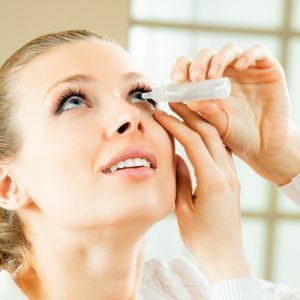 There are many causes of dry eye and can affect both young and older patients, but the likelihood of developing this condition increases with age. With every blink, tears are spread across your eye. Your tears help fight infection, but also keep your cornea hydrated (moist), smooth and clear. If you have ever scratched your eye, you know that the cornea is very sensitive. It has lots of nerve endings making it one of the most sensitive tissues in the body. Your cornea is also responsible for about ⅔ of the focusing power of your eye (this explains why laser vision correction is so effective). This explains some of the more common symptoms: redness, blurry vision, sensitivity and pain. The bottom layer, the mucin layer, is produced by special cells located in the conjunctiva, the clear outside coating of the eye. The mucin allows even spreading of the tears and also fights infection. The lacrimal glands produce the actual tears. There is one lacrimal gland for each eye. The oily layer is produced by the Meibomian glands. These are tiny glands found on the edge of your upper and lower eyelids. The oily secretions prevent tears from evaporating too fast. Think you have dry eye? Call us to make an appointment or email us!